These issues can be overcome by warming the entire floor area - underfloor heating using piped warm water is the most modern and energy efficient option for heating homes and other buildings. These systems which usually feature individual programmable thermostat control to each room, provide high levels of thermal comfort, unobtrusively and at lower cost. This is because it has been found that lower temperature settings are found to be comfortable due to the evenness of the warmth. 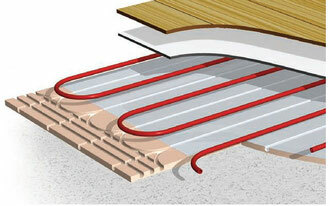 Underfloor heating makes use of the lower flow temperatures provided by renewable heat sources such as heat pumps (35 - 40C) thus ensuring the heat pump can operate at maximum efficiency. Please click the Thermoboard image link to visit the manufacturers site where full details of a range of systems suitable for 99% of UK home constructions.